Stage 1 passes through Jeseníky PLA and Orlické Hory PLA. Stage 2 is particularly well endowed with such zones, featuring (in order of appearance) Broumovsko PLA, Stolowe Mountains NP (Poland), Krkonoše NP, Jizerské hory PLA, Lužické hory PLA, Saxon Switzerland NP (Germany) and Bohemian Switzerland NP. Stage 3 can only boast Labské pískovce PLA, although it then heads into the Ore Mountains, which are very beautiful despite being neither an NP or a PLA. Stage 4 runs the entire length of Český les PLA. Stage 5 is devoted to the gorgeous Šumava NP and PLA. Just over the border is the Bavarian Forest NP in Germany. Stage 6 has Třeboňsko PLA, Podyjí NP, Thayatal NP (Austria) and Pálava PLA. And Stage 7 rounds off the trip with Bílé Karpaty PLA and Beskydy PLA. 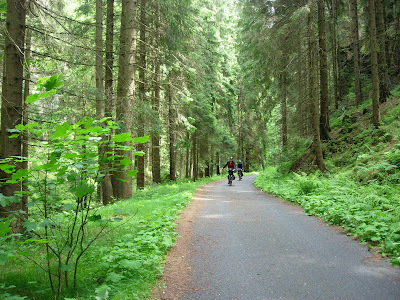 My friend Ryan and I cycling through the Bohemian Switzerland NP on our way to Berlin this year (above) and on the border between the Šumava and Bavarian Forest NPs en route to Munich in 2008 (below).